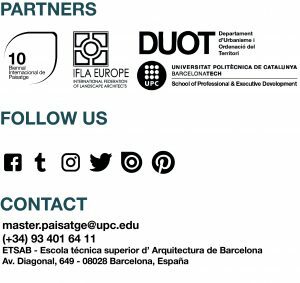 WATER SYSTEMS: COASTS, RIVERS, AGRICULTURE – Master in Landscape Architecture Barcelona – Universitat Politècnica de Catalunya – 35ª EDITION. Litoral systems, fluvial borders and streams are one of the most specific issues that landscape architecture addresses, especially, in regions as the Mediterranean one. In order to design seafronts, riverfronts, marshlands, etc., approached from the perspective of the improvement of deteriorated spaces, one has, always, to deepen into the knowledge of the contact between land and water, and as a consequence, with vegetation, dealing with the issues of transformation, management and maintenance. The aim is to understand the water cycle and its mechanisms, to look at hydric systems as a way to read the territory. The studio is dedicated to the work on spaces where the land drainage has a dominant role in the shape and processes that constitute the landscape. Working in those places makes necessary an approach from the view of the several disciplines concerned in this design field through conferences given by a wide range of specialists. This theoretic background allows students to face real situations in the projects developed. In that way, the students can perceive the great complexity of economic, legal, social or environmental criteria of this kind of landscape situations. Related theoretical subjects: Landscape Theory, Geology, Hydrology, Soil Science, Ecology, Phytogeography, Planning, Management and Law. In this studio, the students work on a small scale, ranging from 1:2000 to defending some details to 1:50, always following the general theme of workshop. Unlike the first module in this one, the students work at larger scale, analyzing the project environment from a scale of 1:5000, coming to work to 1:1000, following the general theme of the workshop. – Recognize and solve specific problems about new water-boarder landscape concepts such as littoral, coastal, riverbanks, etc. – Understand complexity of riverside landscapes. Learn action and control techniques of transversal systems of appropriation. – Understand how to maintain and manage water landscapes. – Understand complexity of urban metabolism, its vulnerabilities and design opportunities in relation with fluvial dynamics. – Traineeship in acting and designing around riverside landscapes and acknowledge various aspects that compose these landscapes. – Study the international casuistry, new work models and designing techniques. – Learn new theories that are coming on stream. – Analyze new ways of mobility and accessibility. – Research colonization and decolonization of a space: the ephemeral, spontaneous and informal VS dynamics and natural processes. Before evoking what it is for given a landscape topic, the undisputed value of rivers as landscape image, or their role as structures that communicate – a geography classic -. I would like to introduce a first general argument over the specific global nature and materiality of rivers on the environmental project: It is and it cannot stop being the source of life, which combined with the earth, determines the environment where we live at. Water doesn’t have a given shape, it transforms into its recipient, and overall, it shapes the space that channels through. Matter and form, content and container, full and empty, it behaves as a unity, and this could mean the best synthesis of the landscape idea, just if out of this unity derives the capacity to be permanent (…) The river might be the main element in landscaping, an indisputable clue for the understanding of environmental design. It’s a most, then, to insist about rivers: spaces of variable content and form, inevitable branches out of a structure that needs them over its quest to always be present; places where culture, matter and shapes meet; spaces of the future that allow to imagine many other futures.